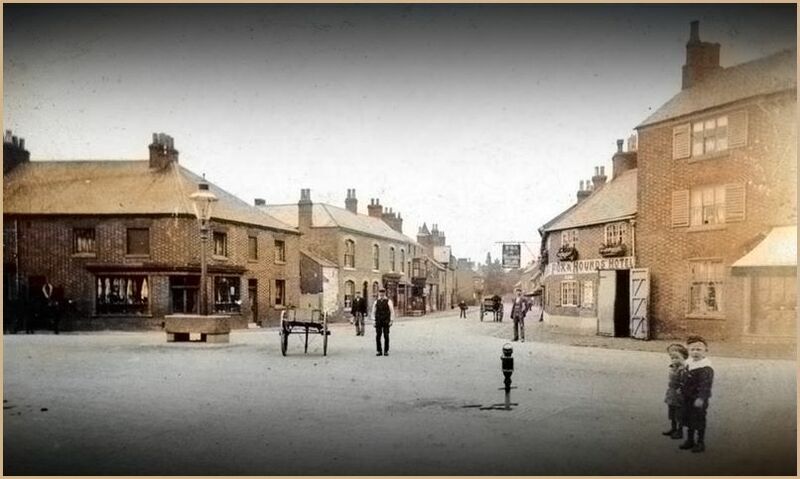 The photo is of the centre of Syston, Leicestershire, looking down High Street, the Fox and Hounds on the right, a water trough where the memorial was later placed and even later removed. The tall house on the right would one day become Todd's chemists' and then eventually morph into another business. I wonder who the people are. Who the children grow up to be. Who their parents are. And what that strange device is in the middle of the street. This photo was found on Pinterest here. I have used an image search to try to find the origin, with no success. It's not one of the Francis Frith collection--it is from way earlier than that, possibly from the time of this story about the butchers of Syston, and what happened in the Fox and Hounds, and it looks like it might even have been taken on the same day as the print that I have in my own collection, whose origin too is unknown. The boys are wearing the same white collars. The window boxes on the pub look the same. The awning over what-would-become-Todd's-where-I-would-later-work is open in both photos. Can anyone identify the date, or the photographer, or another copyright holder? I would very much like to attribute the photo ASAP. Does anyone have a higher-resolution scan of the original--this one pixellates when you try to zoom in, and I'd love to have a go at restoring it a little more. Contact me if you have any more info.